I prefer reading text and browsing the web on the bigger iPad, but in terms of actually holding the device the mini wins hands down. One iPad is better to look at and one is better to hold. It’s a real problem. The obvious solution would be to give the iPad mini a Retina Display. Once again, in our Podcast on this topic, Brian offered poignant insight: a Retina Display likely won’t come to the iPad mini. With the exception of the iPhone 5, Apple has preferred outright quadrupling of pixel count (2x in each dimension, option #1) to create a Retina Display. With the mini’s display using a 1024 x 768 resolution, this option would give it a 7.85-inch 2048 x 1536 panel. That would be the same resolution as the iPad 3/4, but in a much smaller display giving it a pixel density of 326 PPI (vs ~263 for the iPad 3/4). Apple could do this, but it would then need to make all of the same changes it made in going to the iPad with Retina Display, primarily the introduction of a larger battery and much larger SoC. The bigger battery is needed to drive the more powerful backlight, and the X-series of SoCs is needed to actually render the UI and games at such a high resolution. Both of these things would increase the size and cost of the mini, which would make it distinctly un-mini. The second option would be to pick a new resolution that wasn’t an integer multiple of the current one, say 1600 x 1200. You could maintain the same aspect ratio, but you’d just get greater pixel density. The problem with this approach is iOS for the iPad projects points in screen space to one of two resolutions: 1024 x 768 or 2048 x 1536. Picking a non-integer multiple of those resolutions would force Apple to do some scaling and filtering to hit the new resolution, which could reduce quality. Apple does this on the MacBook Pro with Retina Display to enable higher resolution modes. To maximize image quality however, Apple renders the desktop offscreen at 4x the resolution and then scales down to fit the panel. There are obvious performance concerns here as well. The final option would be for Apple to take the iPhone 5 route and just pick a new resolution and enable support for it. The only downside to this option is that developers would have to target yet another type of display. As we’ve seen with the iPhone 5, that can be done but it also means a number of applications may take a while to get updated, if they are at all. None of these options is particularly enticing for Apple, especially given the low (for Apple), starting price for the iPad mini. If you’re expecting next year’s mini to have a Retina Display, I wouldn’t hold your breath. You could say the iPad mini is just a smaller iPad. You could also say it’s the distillation of everything that makes the iPad the top-selling — and best — tablet available today. However you regard the iPad mini, it is one of those rare products greater than the sum of its parts. In fact, the mini’s super light, diminutive body, high quality construction, industry-leading app ecosystem, ten hour battery life, and worthy performance actually make this our favorite iPad to date (even despite bearing a lower overall gdgt Score than its 10-inch sibling). However, it is by no means perfect, and there are trade offs to consider. Most glaringly, its vivid, beautiful display is sadly far lower resolution than its competition — not to mention the myriad other Apple products featuring Retina displays. It simply doesn’t look as crisp as other devices. (Don’t be surprised if the iPad mini 2 eventually fixes this chief deficiency.) And while its $329 price tag means it isn’t the best bang for the buck among small tablets — that award still goes to the outrageously low-priced (and unprofitable) $199 Nexus 7 — make no mistake: the iPad mini is easy to love and very much worth every penny. My take after spending a bunch of the weekend with the iPad mini: This is the real iPad. With the exception of screen sharpness, everything about it is better than the bigger, “classic” iPad — and screen sharpness won’t be a deal breaker for the vast majority of people. – The best thing about the iPad mini is its weight — it’s almost effortless to use, and that’s a big difference. The full-size iPad is more luxurious with its bigger screen, but its weight and density always made it a little tricky to use. I read on my iPad most nights to fall asleep, and even just holding it steady and upright requires actual effort. (The cracking blow of an iPad 3 falling onto my face and nose, after I’d drifted to sleep, is one I’d never like to experience again.) I feel more confident holding the iPad mini, which means I’m more likely to use it in more places — the whole point of an iPad. – The non-retina display is a bummer after spending half a year with a retina iPad. But it’s worth the tradeoff. I’ll definitely be replacing this with a retina iPad mini when they’re available, probably in a year or two. This is primarily a reading device for me, and there’s nothing like reading on a retina display. (Ok, a well-printed book, I guess.) But an arm’s length away, the iPad mini screen is good enough not to drive me crazy. Small text is hard to read, but zooming around is easy enough. Again, the dramatic increase in portability is worth it. – I have never wanted an Instagram iPad app more badly than I do now. Pretty much every other iPad app looks great, and I’ve started fresh with a skeleton crew of apps — Twitter, iBooks, Instapaper, a few others, and that’s it so far. But the iPhone (non-retina) version of Instagram looks horrible on this thing. Let’s do this. – The big question, which I won’t know the answer to for a few weeks or months, is how the iPad mini will fit into my gadget routine. Where will I use my iPhone instead of my iPad mini if I have both? Where will I bring my retina iPad? (There’s still nothing like watching HD video on a retina screen. Planet. Earth.) Will I ever bring both iPads? (One has LTE, the other needs to tether.) What about my 2-year-old-but-still-unbelievably-quick MacBook Air? If I were to design my ideal technology kits for a week-long business trip, a Saturday around town, or a normal day of work, they’d all probably be different. Is the iPad mini too much like a phone? Is the big iPad too much like a laptop? Which do people want to buy more? That’s what we’ll eventually find out. What will we use it for? Everything we use the iPhone for, except phone calls. And many things we use our computer for, except everywhere. This includes: Listening to music, watching videos, surfing the Web, reading e-books and Instapaper articles, playing games, writing blog posts, etc. We won’t use it for Photoshop or anything we need a real file system for. But that’s okay — that’s why we have a computer at work and at home. Perhaps the most impressive part: Back then, I thought it’d be lucky to be able to buy one of these things for “for $600, or $700 with more memory. Halfway between the MacBook and the iPhone, right where it belongs.” The iPad mini starts at $329 — half the price I’d imagined. (And its so-so competitors are even cheaper.) That’s pretty nuts. I’ve been asked by several readers why, if this is a seemingly better form factor, Apple didn’t go with this size for the original iPad. I think there are several factors. First, I don’t think they could have, technically. The original iPad in 2010 was pretty thick compared even to the iPad 2. If they couldn’t make it thinner then, I don’t think they could have made it smaller either — not at the same price points. Second, thinness and weight aside, I think the 9.7-inch size was better to start with conceptually, to establish the iPad in consumers’ minds as something they might want to own. The biggest complaint about the original iPad upon its unveiling was that it was nothing more than a “big iPhone”. That would have been an even bigger complaint if they’d launched with the smaller 7.9-inch display instead. The bigger difference in physical size made it even more likely that developers would do the work to create iPad-optimized versions of their iPhone apps, too. Another week in, though, and I’m more convinced than even a week ago that the iPad Mini is the best size for most people. It’s last decade’s iPod story all over again. Once you feel it, you know it. LG Display and AU Optronics were found to have supplied the display components. Parts related to the display cost about $80, or about 43 percent of the total BOM. The screen uses a new technology known as GF2 that allows the overall display to be thinner than on previous generations. Andrew Rassweiler, an IHS analyst and head of the company’s teardown team, says that the new technology is proving somewhat problematic to manufacture, which is, for the moment, driving costs on the display up. But as kinks in the manufacturing process are worked out, those costs will come down. Happy iPad mini day. Since my review a few days ago, by far the number one question I’ve been asked about the device is: how does it fit into my life? Do I really need another iPad — let alone a smaller, less powerful one with a non-retina screen? Will I use it alongside the regular iPad? What about alongside a MacBook? Instead of those devices? This question keeps coming up, of course, because everyone is trying to understand how the iPad mini might fit into their lives — or if it will at all. Granted, I’ve only been using one for a little over a week, but I think I already have a pretty good sense of where it will fit into my life. Caveat emptor: I’m not a typical user. That’s probably obvious. But because I’ve had nearly every Apple device made over the past five years, I’ve had the opportunity to try all sorts of different combinations of products for my daily routine. And I think I have a pretty good sense of what I would use if I could only pick, say, one or two of those devices. First and foremost, the iPad mini is a winner. No question in my mind that it’s one of the best devices Apple has ever made. No, it doesn’t have a retina display — but the more I talk to people about this and show it off, the less of an issue this seems to actually be for most people. And yes, we all know that retina display will eventually come. Maybe a year from now, maybe two years from now — it’s impossible to know. But if you’re at all on the fence about the iPad mini and you can afford it, I highly recommend making the jump. It’s fantastic. If you already have an iPad and question why you would want the iPad mini as well, the situation is clearly more complicated. For me, personally, I want both. I’m already using them for different purposes. For the past several months, ever since I bought Logitech’s great slim keyboard for the iPad, I’ve been using the iPad (3) for much of my computing work and play. Yes, that includes writing and emailing. With a physical keyboard, I actually find myself working faster on the iPad than I do on a regular computer because I’m less distracted thanks to the one-app-at-a-time aspect. I’m very, very close to being able to go completely PC-free (meaning Mac/MacBook, not a Windows PC — I’ve been free of that for years). I’m not there yet, but I suspect I will be soon. And yes, again, I recognize that I’m an outlier. If you program, need Excel, etc, you’ll want a PC still. For now. 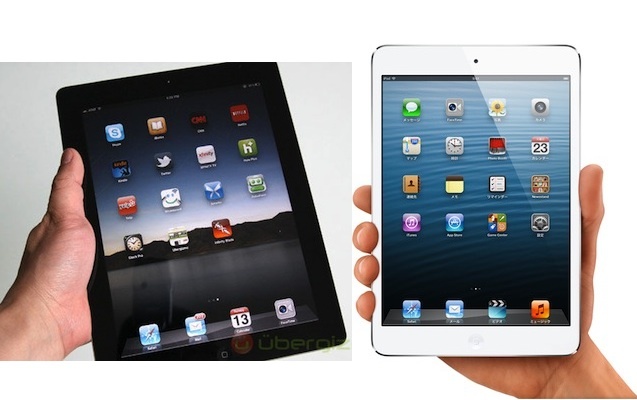 My point is that ultimately, I see myself carrying around a large, powerful iPad for work and the iPad mini for play. That’s not to say you can’t work on the iPad mini or play on the regular iPad, but the form factors are different enough in my mind that this is how I’m already using them. If you don’t want a two-iPad lifestyle, that’s totally understandable. I suspect that the iPad ecosystem is going to play out similar to what we saw with the iPod. That is, the original, larger one is the iconic device that lives on for power users, but it’s the mini version that takes the product line to new heights. I suspect it will become the best-selling iPad relatively quickly. Maybe even this quarter. In other words, if you’re debating between a large iPad and the mini version, you’re probably going to buy the mini version. And for most users, I think that will be the right choice. Yes, this is sort of ironic given Apple’s previous comments about smaller tablets. But they nailed it with the 7.9-inch screen. Not only is the size great, the fact that it can use *all* of the over 275,000 iPad apps unmodified is key. Whether or not they lucked into this situation doesn’t matter, it is the situation, and it’s going to allow the iPad mini to flourish immediately. If you also have an iPhone, you may view such a set up as overkill since you’ll already have an iOS device and an OS X device. But I view the iPhone as completely different from the iPad mini. The mini still isn’t small enough to have it with you at all times like the iPhone. Plus, one is optimized for iPhone apps and one is optimized for iPad apps. You may not believe that’s a big difference, but it is. It’s pretty clear that the iPad mini has a lot of potential market fits. There may be some hesitation at first simply because it is a new device. But once people recognize that this really is an iPad in every sense of the word, and that it’s the smallest, lightest, and cheapest iPad, sales will skyrocket. That was my wife’s initial reaction when I handed her the iPad Mini to see what she, an avid daily user of an iPad 3, thought. Her initial reaction matched mine exactly, and perfectly encapsulates the experience. The iPad Mini is not a device you need to spend a lot of time with to understand. My snap reaction from a week ago remains unchanged after a week of daily use. It’s really light and easy to hold one-handed. The hardware design — chamfered edges, less tapered back, metal rather than plastic buttons — strikes me as better, more elegant, than that of the full-size iPad 3/4. But it’s disappointing to go non-retina after using the retina iPad for the last seven months. All of the accolades and advantages of retina displays work in reverse. I adore the size and form factor of the iPad Mini, but I also adore the retina display on my full-size iPad. My ideal iPad would be a Mini with a retina display. The actual iPad Mini display is not terrible. It’s exactly what you think: it feels like an iPhone 3GS display cut to iPad size, including the fact that the pixels seem deeper from the surface of the glass. (It does seem brighter and more vibrant than a 3GS display, perhaps because it uses an IPS panel.) And after a week of using it as my main iPad, the individually discernible pixels are no longer jarring to my eyes. The non-retina resolution is the one and only significant complaint I have with the iPad Mini, and it’s an issue that is only apparent to those of us who already own a nearly-new iPad. For anyone else — those who own an older iPad 1 or 2, and those who have yet to buy their first iPad — the iPad Mini’s display will garner no complaints. I prefer the Mini over the full-size iPad in every single regard other than display resolution, and though I (and many of you) obsess over display resolution, it’s not an issue in the mass market. The biggest surprise at last week’s event was the iPad 4. It wasn’t just the introduction of the Mini, but that the entire iPad lineup was refreshed. With one glaring exception: the $399 iPad 2 remains. It used to be at the bottom of the lineup, and now it’s smack dab in the middle. I was confused by this at first. Why keep the iPad 2 around? Then the answer hit me: the iPad 2 must have continued to sell well over the last seven months. There can be no other explanation. If it weren’t selling well, Apple would have dropped it from the lineup. But because it is selling well, they’re keeping it in the lineup, because they don’t know why it’s selling well. If it’s only because of the lower price, the iPad Mini might obviate it. But perhaps it’s not that people want the least expensive iPad, but instead that they want the least expensive full-size iPad. But the key is that the iPad 2’s non-retina display has not kept it from selling well alongside the retina iPad 3. For many people, retina resolution is nice-to-have, not must-have. I use my iPad primarily for reading. The six apps in my iPad dock: Tweetbot, Safari, Mail, Instapaper, Kindle, and iBooks. Even with Mail, on the iPad I read more than I write; I usually save email writing for when I’m at a Mac. For reading, all of these apps work great on the iPad Mini. Font sizes on some websites can be a little small (tiny type that is legible on retina displays is just on non-retina ones), but most sites look just fine. The Mini feels optimized for reading.